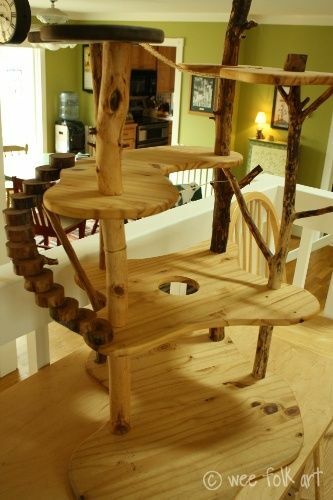 For the DIYers, this cat tree is a masterpiece. It offers so much room! Such a clever way to install steps as well. I love the natural tree branches and how they were used. I can't tell if the perch is covered or not but any cat would enjoy climbing on this. It looks like there may be an additional perch higher than the picture shows as well. A lot of time went into building this wonderful cat tree. Some plush covering on a perch or platform may be nice but overall a Fabulous cat tree! Job well done!